Mohawk 100% Post Consumer Waste recycled paper made with wind power. For all attendees — we are offering a special 20% discount for all custom orders of 25 – 100+ journals. Your design, we fabricate together. Below are examples of our custom work and at DesignerJournals website. Designer Journal for a gift or start your collection! Clear your calendar — time to build your own custom Designer Journal for a gift or start your collection! A build your own Designer Journal or Journals (3 max) Wire-O 8.5 x 5.5 with all recycled materials. 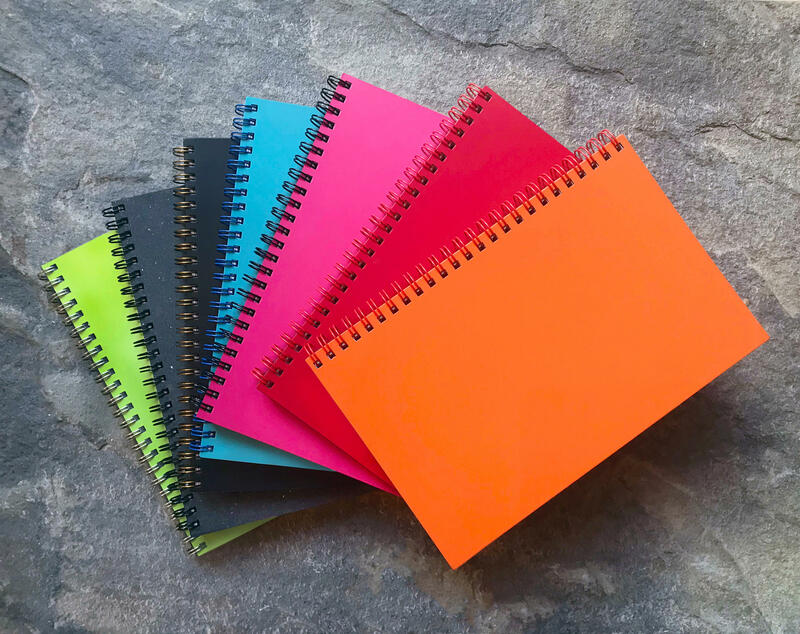 Six cover colors: Orange, Natural Gray, Black, Navy Blue, Red, Turquoise, and Pink (Recycled Italian Leather). Special customization rounded corners and over 25 metal type faces. Finishing with five Wire-O options + interior paper by Mohawk all made with wind power and 100% PCW keeping with the highest recycled standard all made in Upstate New York.